I believe in the "true" Aussie--in a smaller package; a versatile dog with the brains and beauty to compete in all venues...natural instinct that is easy to live with, physically and mentally sound, with an excellent temperament, loyal protectors and valuable family companions. First and formost my dogs are our family pets, they just happen to be pets that excel. Puppies are raised in my home, under foot, with grandkids, kids and assorted other family pets. MASCA/IABCA/RARITIES/AM/CAN/INT CH Twin Pines GB Blackbriar's Reign of Fire "Dragon"
MASCA/IABCA/RARITIES/AM/CAN/INT CH Twin Pines Aint Gottabe Misbehavin "Maven"
(MASCA Major Pointed) Gottabe's Hurricane @ Blkbriar "Duster"
(MASCA & UKC ptd) Gottabe's Blkbriar On The Spot "ChaChaCha"
IABCA IntNat Ch Blkbriar Gottabe into The Flame "Zane"
IABCA IntNat/National CH Blkbriar Malibu Night Spot "Zoe"
No reputable breeder places a puppy or dog with the idea that it may need to be re-homed in the future, but it does happen. Death, divorce, and other life changes sometimes make it impossible to keep their pet. On an individual basis listed on my available page I will include those looking for just the right forever home, and the information needed to help families decide if the dog would be a good fit for their family. Although I currently do not have any available dogs or pups, please continue to check back as I do help other breeders in the case of a dog that may have been returned or taken back. 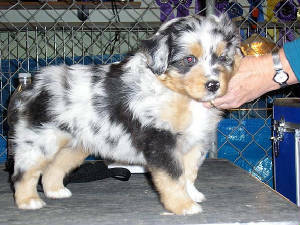 Maven & Dragon were bred by Karen Kipp, Lori McClelland and me; Duster and ChaCha were bred by Lori McClelland of Gottabe Australian Shepherds Click here to go straight to "Gottabe"
Bodie --isn't he a cutie pie! Hours: Mon - Sat 9am-9pm if the machine comes on -- just leave a message or email -- I'm probably gone with the dogs! Have you MASCA'd today? 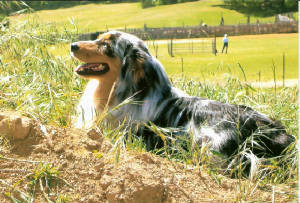 Learn all about the Miniature Australian Shepherd, it's parent club - lots of information.